It was recently reported that Vivo was gearing up to launch a new Y-series smartphone in India. This upcoming smartphone was earlier thought to have been the Vivo Y5. But a new report surfacing online claims that the device is actually the Vivo Y17. 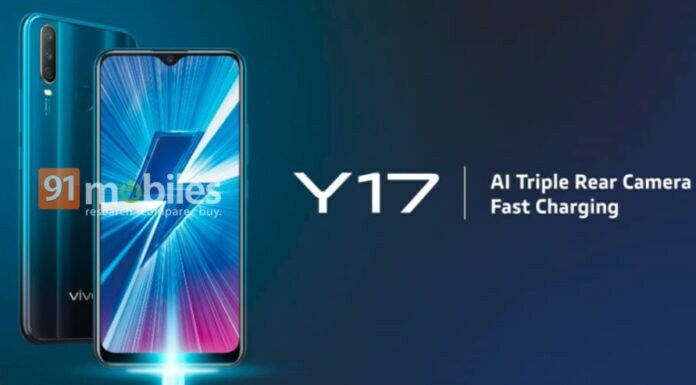 Though Vivo has yet to reveal an official launch date for the Y17, the folks at 91Mobiles have shared a poster that reveals the overall design, and a few key features of the upcoming smartphone. Also revealed is a tentative price tag for the Vivo Y17. The leaked poster shared online shows the front and back of the Vivo Y17, and also reveals its two key aspects. One of the first things you notice is the gradient blue color scheme. It is difficult to say if the device boasts a glossy plastic or glass back design. Up front, the smartphone is seen flaunting a near full-screen display with just a small waterdrop notch at the top. At the back, one can see the triple-camera setup placed at the top-left corner, and a physical fingerprint sensor. The poster also hints at fast charging capabilities. As per the publication, the Vivo Y17 will be launched in India with a price tag of Rs 16,990. As mentioned, there is still no word from Vivo on when it plans to launch the smartphone in India. It is worth noting that the device was recently spotted on China’s TENAA agency under the model name ‘V1901A/T’. As far as the rumored specifications and features are concerned, the Vivo V17 is expected to come with a 6.35-inch display. Under the hood is likely to be a MediaTek octa-core chipset clocked at 2.3GHz. This will be paired with up to 4GB of RAM. The triple camera setup on the Y17 is expected to include a combination of 13-megapixel primary sensor, an 8-megapixel secondary sensor, and a 2-megapixel third sensor. For selfies and video calling, the device is expected to come with a 16-megapixel sensor up front. Making sure everything ticks will be a big 5,000mAh battery, and on the software front, it will run Android Pie-based FunTouch UI.